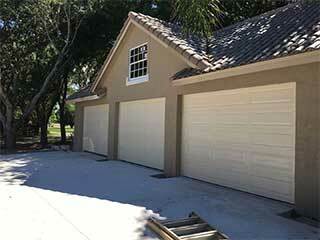 Dealing with any sort of garage door repair issue on your own can be frustrating. What’s more, it can become dangerous, not to mention costly. To avoid a small drama becoming a crisis, our skilled technicians offer regular garage door maintenance checks. During these appointments our team will carry-out minor tweaks and repairs, saving you both money and time in the long run. A fully-functioning garage door opener makes life a lot easier. However, as a machine, it must be tested and safety checked to ensure that all elements are working effectively. Our team will confirm if your safety sensors are working correctly and readjust the photo eyes if needed. We can also test the auto-reverse function to ensure there are no issues there. Garage door springs and cables need to be regularly checked for any potential breakages. Although well-made and built with durability, these components are not indestructible. They’re under considerable stress on a regular basis and are subject to wear and tear. Lubricating these sections to keep the door moving silently and efficiently, along with replacing them before they break, is ultimately the best way to avoid costly repairs. Thanks to the rollers attached to the sides of your panels, your garage door should open smoothly and easily. They’re guided up and down, moving inside the tracks to ensure that your door moves steadily. Tracks that have become bent can cause rollers to pop out which may cause the door to stick, or even worse, come off track completely. Our professionals can straighten out sections that are bent and ensure that the wheels are sufficiently lubricated to ensure they move as smoothly as is possible. If you’re concerned that a part of your system is likely to break, or you want to head off potential problems, contact our local team at Garage Door Repair Sun City West. Follow in the footsteps of countless other satisfied customers and talk to us about our regular maintenance service.